profilestructs = exposureprofiles(dates,exposures) computes common counterparty credit exposures profiles from an array of exposures. profilestructs = exposureprofiles(___,Name,Value) adds optional name-value arguments. 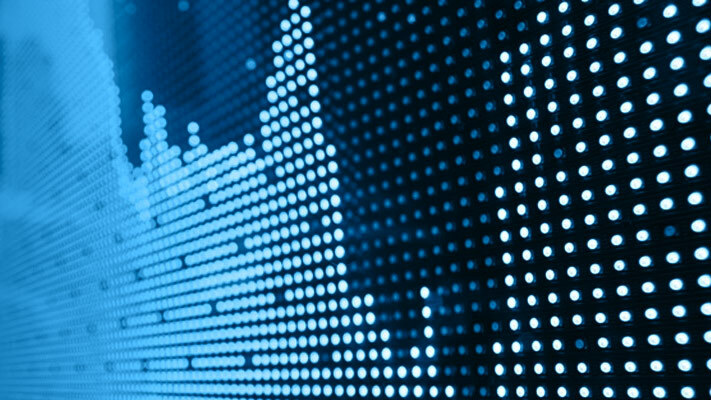 After computing the mark-to-market contract values for a portfolio of swaps over many scenarios, view the exposure profiles of a particular counterparty. First, load data (ccr.mat) containing the mark-to-market contract values for a portfolio of swaps over many scenarios. Compute the exposure by counterparty. Compute the credit exposure profiles for all counterparties. Visualize the exposure profiles for a particular counterparty. Simulation dates, specified as vector of date numbers or a cell array of character vectors in a known date format. For more information for known date formats, see the function datenum. 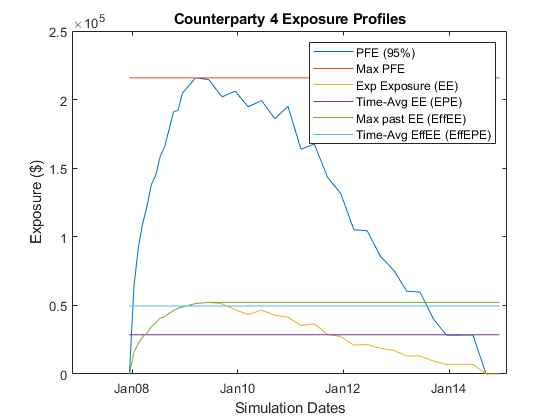 3-D array of potential losses due to counterparty default on a set of instruments simulated over a series of simulation dates and across many scenarios, specified as a NumDates-by-NumCounterParties-by-NumScenarios “cube” of credit exposures. Each row represents a different simulation date, each column a different counterparty, and each “page” is a different scenario from a Monte-Carlo simulation. EE — Expected Exposure. The mean of the distribution of exposures at each date. A [NumDates-by-1] vector. PFE — Potential Future Exposure. A high percentile (default 95%) of the distribution of possible exposures at each date. This is sometimes referred to as “Peak Exposure.” A [NumDates-by-1] vector. EffEE — Effective Expected Exposure. The maximum expected exposure (at a specific date) that occurs at that date or any prior date. This is the expected exposure, but constrained to be nondecreasing over time. A [NumDates-by-1] vector. EPE — Expected Positive Exposure. The weighted average over time of expected exposures. A scalar. EffEPE — Effective Expected Positive Exposure. The weighted average over time of the effective expected exposure (EffEE). A scalar. All — Generate all the previous profiles. Exposure profiles are computed on a per-counterparty basis. Level for potential future exposure (PFE) and maximum potential future exposure (MPFE), specified as a scalar with value [0..1]. Structure of credit exposure profiles, returned as an array of structs holding credit exposure profiles for each counterparty, returned as a struct, with the fields of the struct as the (abbreviated) names of every exposure profile. Profiles listed in the ProfileSpec (and their related profiles) are populated, while those not requested contain empty (). profilestructs contains the dates information as a vector of MATLAB® date numbers requested in the ProfileSpec argument. Basel II: International Convergence of Capital Measurement and Capital Standards: A Revised Framework - Comprehensive Version. at https://www.bis.org/publ/bcbs128.htm, 2006.